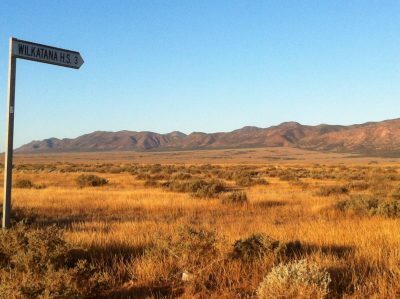 Wilkatana Station is a working sheep and cattle property owned by the Sawers Family for many generations and Managed by Andrew Smart for the past 30 years. Recently, the shearer’s quarters were renovated and now sleep 17 people, all rooms air-conditioned and heated with comfortable surrounds. The kitchen dining area is a communal work space offering ample facilities. The amenities have the original “Donkey” heater and character to suit the region. While staying on Wilkatana your adventure begins! Try the low range 4WD drive track out past the Flowing Bore, through sand hills and out to the Salt Lakes. Enjoy BBQ’s or cheese and wine and watch the sun set marvelling at the colours of the outback. Explore Edward John Eyre’s historical Depot Creek site along the Heysen Trail taking a step back in time or enjoy the more strenuous challenge of Mt Arden. Walks may be taken at your own pace and pick up and drop offs are available. Wilkatana offers a wide range of flora and fauna with over 130 birds sited here on the property. Get your group together be it a passion, hobby or interest or simply a group of friends catching up for a well deserved holiday, Wilkatana Station offers comfort, style and relaxation to enjoy.